Johnny Carlson presents his firm’s plan for a development at 1727 Oak Ave. to the Plan Commission on April 11. After passing the Plan Commission, City Council voted 7-1 to advance the special permit for introduction at Tuesday’s council meeting. Aldermen are set to vote on a special use permit for a 17-story, age-restricted rental development at 1727 Oak Ave. during Tuesday’s City Council meeting. At a council meeting on May 14, aldermen voted 7-1 to advance the special permit for introduction. However, multiple council members voiced concerns about the development leading to increased traffic on Ridge Avenue. The proposed building would include 169 units, a dog park, a pool and 139 parking spots. 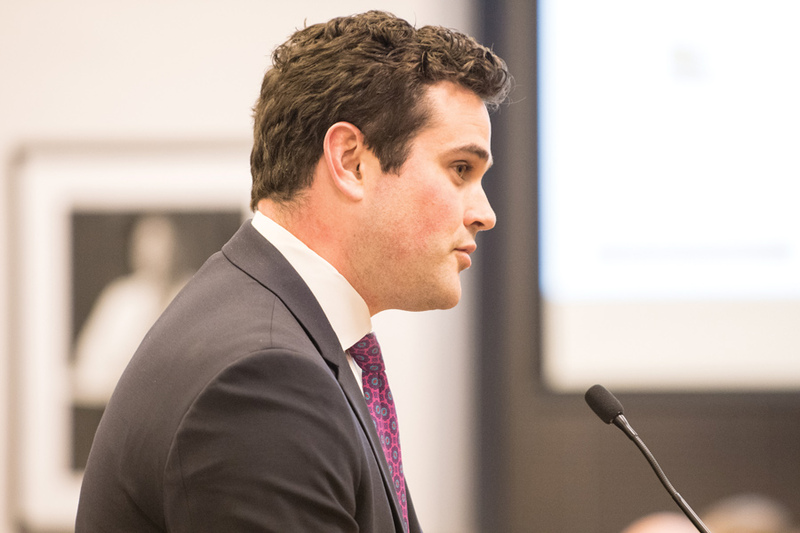 Johnny Carlson, principal of the midwest business unit for the developer Trammell Crow Company, said at an April 11 meeting that all apartments would have at least one tenant age 55 or older. According to city documents, the special permit will grant four development allowances: increasing the number of units, increasing the building height, changing the front yard setback and requesting loading zones. The developer also requested to separate the lot from 1007 Church St., according to city documents. Aldermen will also vote on another proposed development — a five-story, mixed-use building at 128-132 Chicago Ave. The building will include 26 residential units, along with a teaching garden, an organic plant yard and a cafe serving organic, locally sourced food. David Brown, president of Harrington Brown LLC, said at a meeting on April 18 that the building would be the first garden-based lifestyle center in the country.